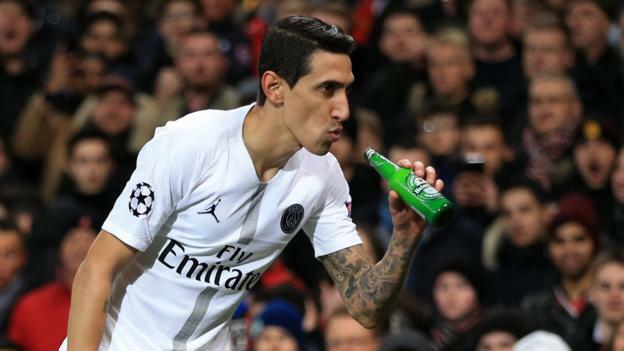 He was booed relentlessly by Manchester United fans and had bottles thrown at him – but Angel Di Maria ultimately had the last laugh on his return to Old Trafford. The Paris St-Germain winger is unpopular with some United fans after underachieving in one season at the club – but assisted both goals as the French champions won 2-0 in the first leg of the Champions League last-16 tie in Manchester. His evening did not get off to a good start. “He got booed getting off the coach even way before he went to warm up on the pitch. So it started early from United fans,” French journalist Julien Laurens told BBC Radio 5 live. It looked like his evening would come to a premature end in the first half when he suffered an injury after Ashley Young shoved him off the pitch and into a metal barrier. The Argentine was able to continue after treatment, but PSG boss Thomas Tuchel was not happy. Di Maria also missed a glorious chance when he hit a shot straight at David de Gea – and was thankful to see the offside flag raised. “He had a hard time in the first half,” said Tuchel. “The guy is very competitive. If you tease him, it does not make him weaker. Di Maria went on to have a big impact in the second half, providing two vital assists, the first a corner that picked out Presnel Kimpembe to smash home from close range. As PSG celebrated, he screamed at the United fans. “After the corner there were a few words thrown at the crowd,” said Laurens. Minutes later, as he went to take another corner, a bottle of beer was thrown at him, although he at least saw the funny side by pretending to take a swig. Another bottle, this time full of water, was thrown his way before he set up PSG’s second goal – his left-wing cross swept home by Kylian Mbappe in the penalty area. Di Maria was booed off when he was replaced on 81 minutes. “We didn’t see this type of performance from Angel Di Maria under Louis van Gaal when he had the red shirt of Manchester United on,” ex-United defender Phil Neville told Radio 5 live. Why was Di Maria booed by Man Utd fans? Much was expected of Di Maria when Van Gaal signed him for a British record £59.7m in 2014. But just one year later, after four goals in 32 games, he was sold to PSG for £44.3m. He was played in six different positions during his season in England, and there were reports he was unsettled by an attempted break-in at his Cheshire home. “It’s a travesty that he wasn’t a great United player,” added Neville. “When he signed I thought, ‘Play him on the left side of midfield, play him on the right and at last we’ve got a winger again, someone who fits the philosophy of the club’.